So, I'm a mean mommy. On the babe's birthday invites, I asked that our friends and family not give G gifts to celebrate his first year on Earth. But the kid doesn't need anything and we are still up to our eyeballs in boxes. I literally haven't figured out where to store my underpants, let alone a dozen new toys and books and instruments. And while I stand strong by my mean mommy no gifts policy, I did find a teensy loophole to ensure that the babe had a least one fun box to open to celebrate his (still upcoming) big day. Gray can thank Elizabeth from Chasin' Mason for inviting us to participate in the Toddler Blogger Birthday Gift exchange. How cute is she to put together such a fab group of bloggers and babes who rock summer birthdays? Many, may thanks to Elizabeth for including us and to the HALLway girls for all of their sweet gifts and birthday lovin'. We sent a little something over to sweet T in honor of his 3rd birthday being just around the corner and you just have to go check out his sweet face as he opens the box! Wanna see the rest of the babe's and their birthday bliss? Oh my gosh, LOOK at his face.. Too cute!! :) Looks like you have a for sure few minutes of entertainment in that toy. Thank you again for Tyson's doctor kit, it's his go-to right when we get home!! Oh my gosh, he looks like he LOVES his present! His face is too cute! I'm so glad you broke the rules and participated in the gift exchange with us :) Happy (almost) birthday sweet boy! What a sweet boy!! I don't think you're mean at all. He's turning one. My two were more interested in the wrapping than the actual gifts on their first and second birthdays!! It was soo overwhelming for them! Good choice. 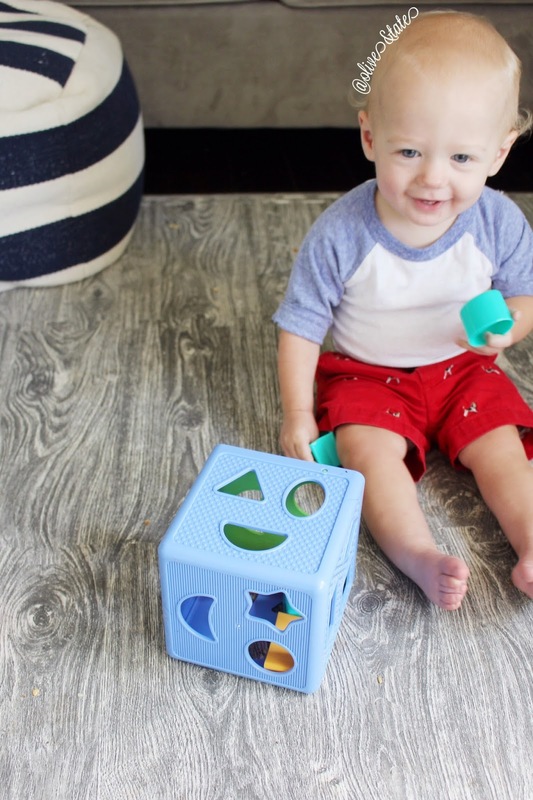 He looks like he loves those blocks! I totally respect that you don't want to share his birth date on the blog but when ever it is, please wish him a big fat Happy Birthday from us!! Happy Birthday to your sweet boy! Have missed your Can't Without It link up. Is it all done or are you just taking a break from it? Have a fun Fourth of July weekend.